Welcome to another edition of Constellation Friday! Today, in honor of the late and great Tammy Plotner, we take a look at “The Cup” – the Crater constellation. Enjoy! One of these constellation is Crater (aka. “The Cup”), an asterism located in the Southern Hemisphere. This small constellation is located south of the ecliptic plane, with no bright marker stars. As part of the Hercules family, it is bordered by the constellations of Leo, Sextans, Hydra, Corvus and Virgo. Today, it is one of the 88 modern constellations recognized by the International Astronomical Union. In Greek mythology, Crater represents the Cup of Apollo – the god of the skies – which is due to its chalice-like configuration. The cup is being held up by the Raven – Corvus – another figure in Greek mythology. The tale, much like many mythological stories, is a sad one, and begins with the Raven being sent to fetch water for his master, Apollo. Unfortunately, Corvus (the Raven) was distracted as he became tempted by a fig, and then waited too long for it to ripen. When he realized his mistake, he returned sorrowfully to Apollo with his cup (Crater) and brought along the serpent Hydra in his claws as well. Angry, Apollo tossed all three into the sky for all eternity, where they became part of the starry firmament. The Crater constellation comes to us from Classical Antiquity and was recorded by Ptolemy in his 2nd-century CE tract the Almagest. However, it was also recognized by Chinese astronomers, where the stars associated with it were viewed as being part the Vermillion Bird of the South (Nan Fang Zhu Que). 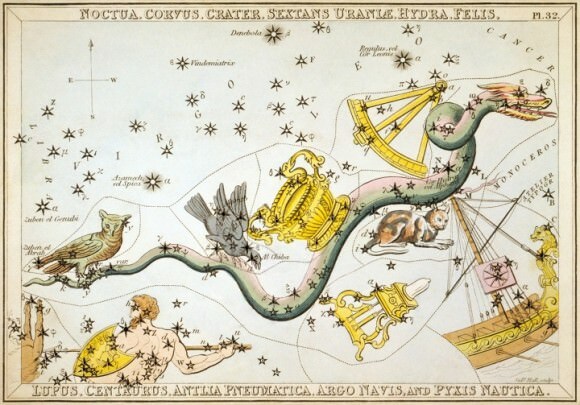 Along with the some of the stars from Hydra, they depict the Red Bird’s wings. Crater has only a few bright stars associated with it and no Messier Objects. The brightest, Delta Crateris, is an orange giant located approximately 196 light yeas from Earth. The star is also known as Labrum (Latin for “the lip”), due to the fact that it was sometimes associated with the story of the Holy Grail. Next is Alpha Crateris, an orange giant located approximately 174 light-years from Earth which is 80 times more luminous than our Sun. It is also known as Alkes, derived from the Arabic word alkas, which means “the cup”. Then there’s Beta Crateris, a white sub-giant that is located approximately 266 light years from Earth. This star is also known by the name Al Sharasif, which means “the ribs” in Arabic. In terms of Deep Sky Objects, Crater has no associated Messier Objects, but a few galaxies can be found in its region of the night sky. These include the Crater 2 dwarf galaxy, a satellite galaxy of the Milky Way that is located approximately 380,000 light years from Earth. There’s also the spiral galaxy known as NGC 3511, which has a slight bar and is seen from Earth nearly edge-on. There’s also the NGC 3887 and NGC 2981 spiral galaxies, and the RX J1131 quasar, which is located 6 billion light years away from Earth. Interestingly, the black hole at the center of this quasar was the first to have its spin directly measured by astronomers. Crater is visible at latitudes between +65° and -90° and is best seen at culmination during the month of April. It is comprised of only 4 main stars, and 12 stars with Bayer/Flamsteed designations. In order to spot these stars, observers should begin by looking for the Alpha star (the “a” shape on their star map) with binoculars. 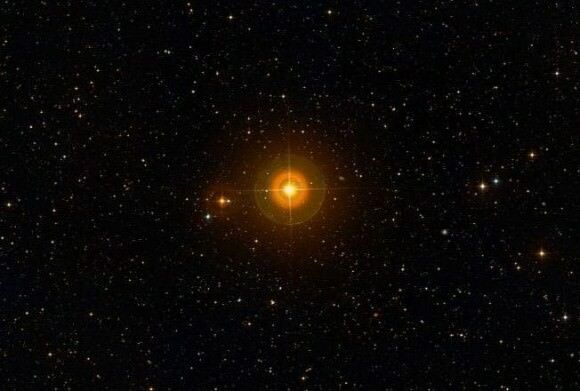 Situated some 174 light-years from Earth, Alpha Crateris (the star’s official designation) is a spectral class K1 star – an orange giant that’s a little different from the rest. This is because Alkes is a “high velocity” star, which means it moves far faster than the stars around it. Another thing that sets it apart is its high metal content, which according to some researchers, it may have picked up when it came from the inner, metal-rich part of the Galaxy. Next, observers should look to Beta Crateris (the “B” shape on the map) which also goes by the name of Al Sharasif. This star is not an ordinary one either. For starters, Al Sharasif is about 265 light-years from our solar system, and it’s a white sub-giant star. To boot, it also has a low mass, white dwarf companion – which is why astronomers classify it as a Sirius-like system. Next up is Delta Crateris – the “8” symbol on the map – which is an orange giant, spectral class K0III star with an apparent magnitude of 3.56. In time, this star will become an even larger giant, eventually turning into a Mira-type variable star before ending its life as a white dwarf. Oddly enough, Labrum has a very low metal content compared to its Crater-neighbors, containing about 40% as much iron as our own Sun. At this point, observers with telescopes and have a look at Gamma Crateris – the “Y” shape on the map. Gamma Crateris is a fixed binary white dwarf star with an easy separation of 5.2″. Gamma itself is 89 light-years for Earth, which is rather hard to believe when you try to seek out the 9.5 stellar magnitude companion that accompanies it. Although this is a disparate double star, it is still quite fun and easy to spot with a small telescope. For a challenge, try Iota Crateris – a close binary star with an 11th magnitude companion that’s only separated by 1.4″. Psi Crateris is an even closer binary. Both stars are within a half magnitude of each other, but the separation is only 0.2″. Artist’s impression of white dwarf binary pair, a type of star system that describes Gamma Crateris. Credit: Andrew Taylor. 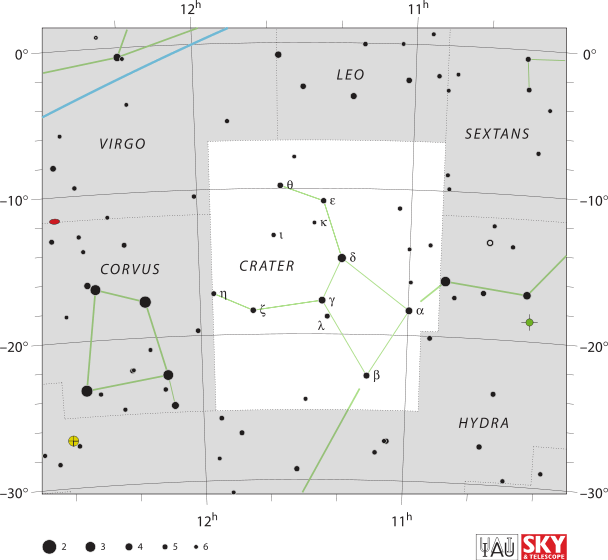 Next up is R Crateris, a variable star that can be observed with binoculars, and which is located at RA 10 56 Dec -17 47. You will notice it by its lovely red color and its nice change of magnitude, which goes from 8 to 9.5 in a period of about 160 days. And then there’s SZ Crateris, a magnitude 8.1 variable star. It is a nearby star system located about 44 light years from the Sun and is known as Gliese 425 – which in the past was known as Abt’s Star. While there’s no brighter deep sky objects for binoculars or small telescopes, there are a couple of challenging galaxies in the Crater constellation that are well suited to a large aperture. Let’s start with the brightest – elliptical galaxy NGC 3962 – which is easy to spot (like all elliptical galaxies), though there’s not much detail to be seen. Even if it is not terribly exciting to behold, it is on the Herschel 400 observing list. And then there’s NGC 3887 (11h47.1 -16 51), a nice spiral galaxy that’s only slightly fainter. It has two faint stars which accompany it and a stellar nucleus which occasionally makes an appearance and provides an opportunity for some very interesting viewing. Both of these galaxies are in the slightly fainter range, both being just under magnitude 11. Observers who are skilled with telescopes should also keep and eye out for NGC 3511 (11h03.4 -23 05), a spiral galaxy of magnitude 11.5. It is joined in the same field of view by NGC 3513, a barred spiral galaxy that is a full magnitude dimmer. People with larger telescopes should also take a crack at spotting NGC 3672 (11h25.0 -09 48), a faint spiral galaxy that nevertheless has nice halo and a bright, apparent nucleus. And last, but not least, there is NGC 3981 (11h56.1 -19 54), a beautifully inclined, magnitude 12 spiral galaxy that has a bright nucleus, and which sometimes shows some spiral galaxy structure when observing conditions are right. Drink up… the “Cup” is waiting!